NewTV reported that the Thai Ministry of Tourism and Sports paid the tourist bitten on the leg by a shark near Hua Hin in April 66,966 baht. 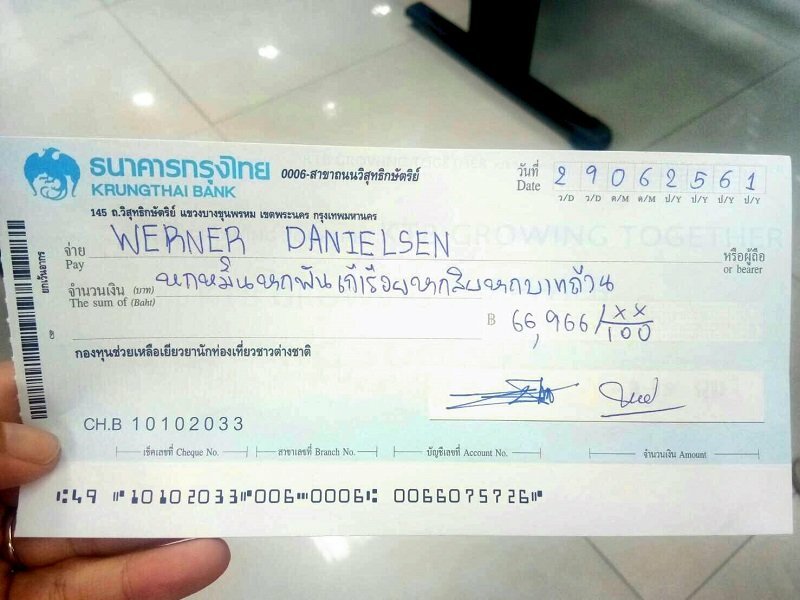 Werner Danielsen, 54, received the money with his Thai wife before he flew back to Norway on Sunday. However, due to a problem with his insurance running out the payment still leaves him more than 200,000 short. Three days in a Hua Hin hospital set him back 300,000 baht. The money came from a Tourism Ministry fund after consideration by a committee. Meanwhile deputy governor of Prajuab Khirikhan Chotnarin Kertsom said that a shark prevention net at the Sai Noi Beach in Khao Tao district would cost 500,000 baht. Discussions are still ongoing about finally installing that nearly three months after the tourist was bitten on the left leg on April 15th. "Three days in a Hua Hin hospital set him back 300,000 baht." that would be Bangkok Hospital in Hua Hin. A sore throat sets you back about 3000 baht. Hua Hin hospital is much cheaper but not like a 5 star hotel. Just write the cheque and get it done. Agree. Medicine alone is marked up over 10 times when compared to common pharmacy prices, and this is exactly the same medicine, not knock-offs. Case in point: 1 box of Singulair at Bangkok Hospital pharmacy 3,000 baht, same exact box at neighborhood pharmacy 300 baht! I don't begrudge a reasonable profit, ... but a 1000%? It is the same price as in most Western countries. I find this challenging to believe. 32 of 33 Western countries have universal health care. The USA is the lone exception. I believe the universal health care is for the citizens of those particular countries only. Universal health care for tourist also ? I always obtain travel insurance when I travel. i once was pinched at hua hin sea by a poisonous jelly fish right at the tip of my johnson. how much does it worth these days with the tourism ministry ? mmm,,, lets see now, of the 33 western countries, oh <deleted>, in all the world, which country has the greatest economy, the most individual/personal freedoms, the greatest military, what country are people from all over the world trying to become a citizen of ?, which country has the highest standard of living in the history of the world, which country has been the most generous in its aid to the rest of the world? I will help you, it's the USA. So, that some loser democrat wants free aspirin cause he's having his period and doesn't feel good doesn't really mean much. I hope you feel better soon be-ach. Of course there is no universal health care for tourists. That idea is absurd in the extreme. Universal health care is for a country's citizens. Unless, of course, you're in Canada as an ex ISIS terrorist or an illegal alien, then you're covered as well. greatest economy = hard work for few rich and police country that does'nt tolerate relaxation like in thailand. (from vietnam war to iraq war - what was it good for) ? nope, you keep your USA for yourself, i stay in thailand. Turned out an expensive rock all-round.